I'd heard that Times Square in new year's eve was so crazy that I gave up the idea to celebrate new year 2010 by watching the Toshiba ad. 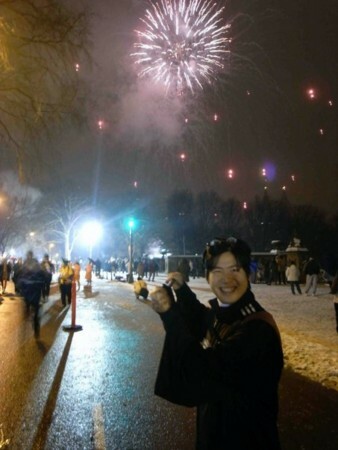 Instead, I registered "New Year's Eve Midnight Run at Central Park". This running event looked so interesting for me. First, celebrating new year by running is a symbolic action as a runner. Second, it's my first time to run at Central Park at midnight. I was curious how the park looked like late at night. Third, I love stupid things, and this event is just crazy in any sense! In fact, this experience was just gorgeous. As my friends, one of them joined running, and I counted down, we saw huge fireworks. This fireworks went on for at least half an hour, and I enjoyed it during the race. It was cold and raining. But I didn't care because I was so happy in the crowds of runners. We said a lot of "happy new year" and showed smiles. When I found out Japanese runners, we said "Akemashite Omedetou!". Student life shouldn't be busier than working life. You may have more time to write about you in such a blog. Due to my laziness, however, I've procrastinated about this running record until now. I feel so sorry, honestly. The day before the marathon, I have to admit I was hanging around New York City with my colleagues. Two of my close colleagues visited NYC for business trips and we met midnight and drunk till dawn. Lucky enough, I was in a good condition and ready for run on the marathon day. I got on a ferry for Staten Island, the starting point. It's 6:30 a.m., dark and cold. As the ferry came closer to the island, I could see the Statue of Liberty clearly. I sometimes think of getting back to home in the morning of marathon, but the view from the ferry encouraged me to run for the race. The runner were around 45,000 people. Even in the early morning, I could see literally thousands of runners. The starting area was divided into 3 parts so that the race could start smoothly. Actually, I didn't feel any trouble in saving a bag or going to a bathroom. My starting time was 10:00 a.m. The race organizer asked us "Are you ready to run?" and we said "YES!!! ", then Frank Sinatra's "New York, New York" was played so loudly. The race looked like a festival from the very beginning. From Staten Island, we soon crossed Verrazano Narrows Bridge. The view from this bridge was spectacular. No wonder many runners stopped in the midst of the bridge and took pictures. I could see the buildings of Manhattan, but it's pretty much small from the bridge. The goal was still far away. Hard to believe I'd be there in a few hours. Lots of spectators awaited us in Brooklyn. 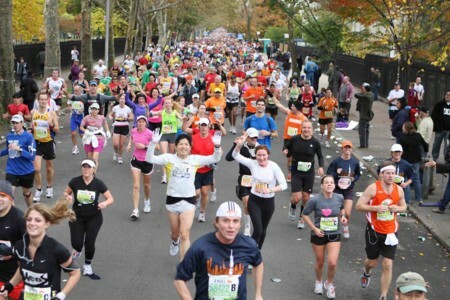 This huge support from spectators is one of the distinctive characteristics the NYC marathons has. People supported us in many different ways. Children loved high fives. Local rock bands played for us. I even saw people singing Gospel in front of a church. I heard a lot of positive words during the race, such as “Looking good”, “I'm proud of you!”, and “You are great!”. In addition, national flags seemed to encourage the runners. Of course, I was one who appreciated so much to those who showed the Japanese national flag and shouted me “Ganbatte!”. From Brooklyn, we headed up to the north and reached Queens. Then, crossing a long bridge, we got to Manhattan at last. The number of spectators was increasing in Manhattan. The voice of people was rumbling. We ran at the East side of Manhattan and headed up further and further. Soon after we got to Bronx, we turned down, and headed down to Central Park. When I ran near Columbia University, I saw some students I know. Central Park was so beautiful with autumn leaves. And the number of spectators reached a peak. I was filled with a sense of exaltation at this point. Never wanted to stop running. The goal time was 4 hours 14 minutes (net). I have to admit, it’s the worst record for me as a marathon. However, I ran at almost even pace. I never walked, stopped, kept smiling during the race. The race was too fun to focus on record. At the goal point, I received a gold medal that certificated my completion. While I was walking back to my home, many pedestrians said congratulations to me. 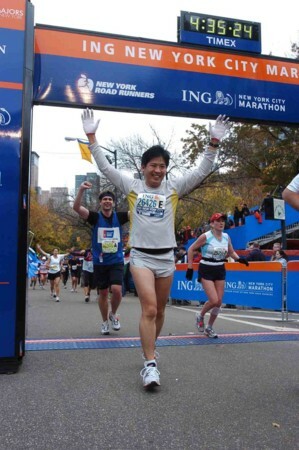 The NYC marathon was the most impressive race ever for me. Next day, I found my name on the special edition of the New York Times as a finisher. The size of my name was small, but gave me a big pleasure. Since the fall semester started, the daily life has been hectic. My school constantly gives us tons of home works. It is rather persistent. In addition, those assignments should be submitted as a group. This means I should save my time not only for reading textbooks and solving problems, but also for group discussions. In this light, it’s been becoming hard to find time for running. On the other hand, NYC marathon is coming soon. I need to prepare for this exciting full marathon in November. Moreover, Central park in fall shows its beauty as it did in summer. Although I have to admit that I didn’t keep records of running and cycling, I did run from time to time in this month. Here are my records. Besides, I started to go to the school by bicycle (since 9/28). Not bad, right? But I haven’t run for over 10 km yet. Before the race, I know I need to hit the ground for more than 20 km at one time. My residence is near Hudson River. It takes 5 minutes to enjoy riverside, say, reading books, having a nap, etc... I add one new thing to my leisure time. Cycling! Along the river, there is a long cycling road, Riverside Path. This time I headed up to Washington Bridge with my bike. Gentle breeze, shining river,and beautiful greens. It's heavenly, actually. yassuu2009/10/02 08:34It is a beautiful place. Bridge in the picture, or New York City Marathon is the starting point for the bridge? Then I tried to find out affordable one in Ebay, and noticed around $200 road bikes. I bought one of them immediately, and wait for a shipment. Finally, it came to my room and I started assembling it. Though, the seller said you'll just spend 20 minutes on the site, but for me, It took about 3 hours to assemble all the parts and to adjust brakes. Anyway, I felt moved when I saw my bike assembled well (at least on the surface) , and took it out for riding. I headed out to Central Park. It's beautiful day. Brakes are much more loose than I intended, but otherwise, it worked well. I have to admit that its ride quality is worse than my Giant bike in Tokyo. But, it was my first time to ride a road bike, and it's actually so nice. I went round Central Park with my bike. I'm riding the same course of running, but the feeling is so different. I felt more breeze, and enjoy the speed. In addition, going up or down sloping roads were so fun! I need to adjust brakes beforehand, but next time, I'll go to Riverside Park. I'm excited. gaznak2009/09/06 01:00My bike is too shabby to adjust lot of parts. I a little bit regret buying so much cheap one... But, of course, please go for cycling with me in Japan! [New York City]Too lazy? Not!